A Purple Cow is something remarkable, something that people will remark upon. Today’s guest is indeed a remarkable man and someone definitely worth remarking upon. An Entrepreneur, Marketing Guru, Man of Many Ideas, Best Selling Author and possibly the foremost author and thinker on leadership and what it means today, Seth Godin. Seth’s career started in the software business in the 80’s after which he started a book packaging company. During that time he also formed Yoyodyne, an Internet marketing company which he eventually sold to Yahoo. Marketing was where he found his first real book success with ‘Permission Marketing’. The books kept on coming as did his insatiable appetite for blogging, which he does everyday. He latterly formed, Squidoo, a community web site where users create and share lens. It may seem like he’s achieved a lot, and he has, but not everything succeeds. As Seth says to succeed you have to fail too (and he’s failed a lot) but not let the failure get the better of you. You have to push through, or ignore, the resistance you feel and stop listening to the Lizard brain. Seth Godin updates his blog every single day. He gets out of bed knowing he is going to publish something and he gets in bed know he has and thinking about what to publish next. He says we all need to just get on and publish, or ‘ship’ as he says. His blog is the worlds most read blog written by a single individual. 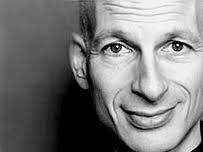 Join Mark Davies today as he talks to Seth Godin.